“I started singing, actually, when I was five years old, at my mother’s concert. She was a teacher of classical Japanese singing, and her students were all men. I used to watch them and listen to them, and it is a type of singing that a gentlemen will sing all the parts in an opera: the male, the female and the child, or whatever the story. I started singing it and copying them, and I guess my mother thought ‘Wow! She knows this stuff,’ so she put me on stage when I was five, and made me the costume the men would wear and I sang. The stage was in Los Angeles and the audience was so intrigued they cried and they threw money on to the stage. In those days it was acceptable to get money thrown at you, now it is an insult! That’s how I started and all of my siblings would always sing. We would put the radio on and sing all the hits of those days. I always loved to sing and my mother was always sure we had music in the house. I still remember her cranking up the old victrola and playing Japanese music, or classical music, I remember her playing Dvorak’s 'New World Symphony' for us. When my mother was alive she always installed the love of music into all of us. By the time I was in grammar school I would go into these talent shows, at school, and participate. I guess I was always a ham. I actually was very shy girl. I was always in the back and never said much, but when it came to music I have always stepped up, and always wanted to sing. My father died when I was four, and then four years later my mother died. Frank (Mary’s older brother) kept us together. He went to work at a nursery. He went to the library and studied books on horticulture, and he still does gardening, but that is how he supported us. If it wasn’t for him we wouldn’t be around, we would have been in an orphanage. He is the one who quit school at 17 to support us, he was our guardian. Can you imagine he was in high school when our mother died. In those days the 1930s. Wow! That was hard. By the time I was 12 years old my brother decided he was going to spend some money, that he could not afford, to send me to music school to learn how to sing properly. I learned proper breath control from Ralph Snyder, who became a family friend. He used to come over to the house and eat with us, or go fishing with us. He was actually a musician for Paul Whiteman, and was his pianist. One of Paul Whiteman’s singers was Bing Crosby, and they were called the Rhythm Boys, and he showed us pictures of the Rhythm Boys and there he was, young Bing Crosby! Ralph taught me until I was 16 years old, and that is when the Japanese were evacuated into camp, and that was the last of my singing lessons." In 1942, President Roosevelt signed executive order 9066 giving the war department authority to define military areas in the Western states, and to exclude anyone who might threaten the war effort. 120,000 men, women and children of Japanese descent living on the West Coast of the U.S.A. were incarcerated. Mary Kageyama Nomura was interned at the Manzanar relocation camp in Eastern California. Two-thirds of the internees were, like Mary, native-born American citizens under the age of 21. Music provided relief during the years of the Japanese American internment during WWII. 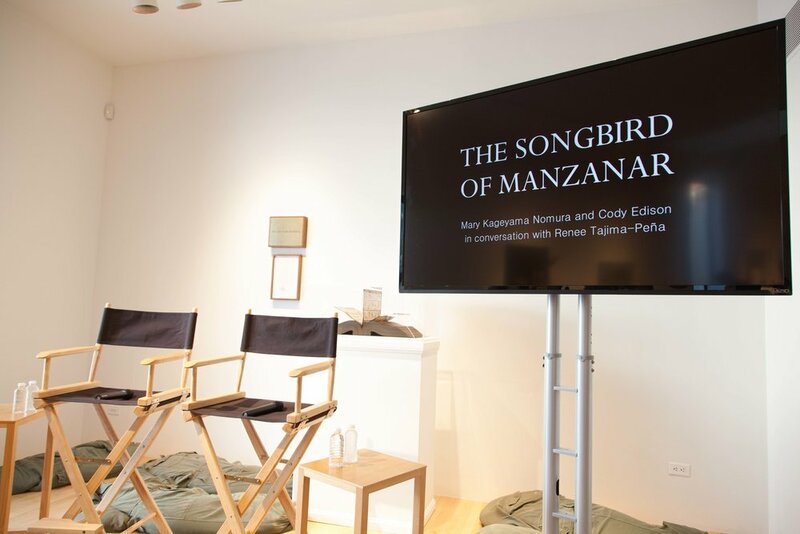 Mary performed in Manzanar all three years she was incarcerated, and she became known as the "Songbird of Manzanar." In this film, Mary shares old field recordings of her self-singing in Manzanar, and these are believed to be the only surviving field recordings of music from Japanese American incarceration camps. In the conclusion of the film, Mary honors her nickname and sings one of her favorite jazz standards by George Gershwin.